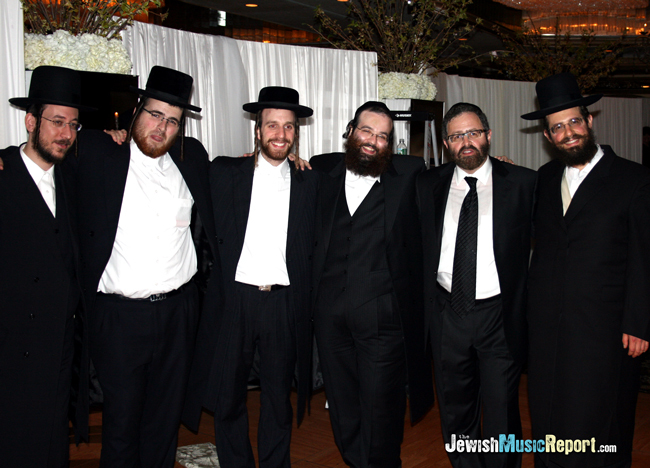 A veritable who’s who of the Jewish music scene gathered at The Sands this past Thursday night in honor of the wedding of Yossi Green’s son Ari to Temima Ehrenpreis. The delectable food and exquisite ambiance were accompanied by a musical feast that was enjoyed by all. The chupah began with beautiful melodies sung by Shloime Taussig joined by Shragi Gold and the Shira Choir. They sang Ki Elokim, a new song composed by Yossi Green for Mordechai Ben David’s upcoming album, as the chosson walked down to the chupah. That was just the beginning of the moving and inspiring chupah. Shlomo Simcha sang a hartzig Mi Adir to the tune of Od Yeishvu followed by a truly unique moment, Avraham Fried singing Anovim to the Kallah as she walked down the aisle. Shimon Craimer sang Mi Bon Siach and just before breaking the glass, Yossi Green sang Z’chor Hashem, a new song composed for Avraham Fried’s upcoming album. Musical accompaniment was provided by Freilach Orchestra: Mendy Hershkowitz (keyboard), Avrumi Schreiber (drums), Nachman Dreier, a newcomer from Israel: (guitar), Buster Hynphill (bass guitar), Shlomo Cohen (saxophone), Justin Mullens (trumpet) and, Yossi Forkosh on the trombone. An elegant string section played throughout the chupah and the meal. The meal began with Levi Yitzchok Folkowitz doing a set of moving Yossi Green songs accompanied by the Shira Choir. Next, Shloime Taussig and Sruly Werdyger sang Modim Anachnu, the title track from Taussig’s new hit CD. They segued into a new intro as the chosson and kallah were brought in and sang the first set. While the main course was served, Shloime Taussig sang Shtar Hatnoyim, followed by Dudu Fischer singing Bring Him Home, dedicated to Israeli soldier Gilad Shalit. The second dance began with Srully Williger’s leibidig delivery of HaGomel. Yeedle sang Lev Echad, the title track from his latest CD and Ashrecha, followed by MBD singing an upbeat set of songs including Usid, Nodeh L’cha, Ani Maamin and Yidden. Other familiar faces at the wedding included Gideon Levin, Yisroel Lamm, Sheya Mendlowitz, Mendy Werdyger, Shelly Lang, Chazzan Helfgott, Chanoch Vinderbaum and Beri Weber. All this was coordinated by none other than Yossi Tyberg and Gershy Moskowitz of TeeM productions who kept everything running smoothly. We here at Jewish Music Report would like to take the opportunity to wish a hearty mazel tov to both the Green and Ehrenpreis families on this beautiful simcha. May they be zoche to build a bayis neeman b’yisroel. We would like to thank www.TaussigMusic.com for compiling the information for us and our editing staff for putting it together and gathering additional facts.